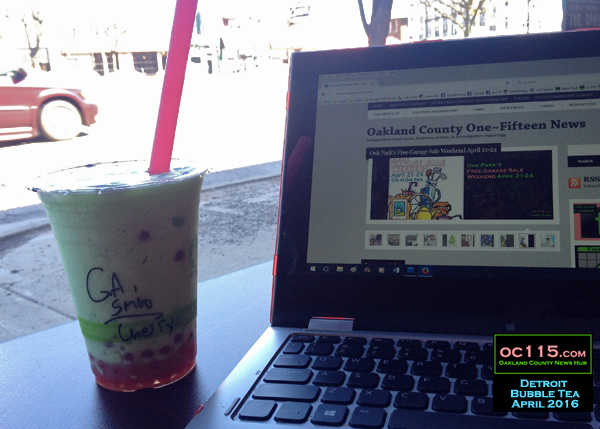 Ferndale, MI – This one time while visiting a Chinese bakery a friend of mine’s kid got a “bubble tea.” It was made out of iced green tea and little tapioca balls at the bottom. At the time I was a Coca-Cola addict and rarely drank anything else. But the little boy insisted that I try it. I took a sip and he laughed when I made the “ick” face. I just assumed that all bubble tea tasted like that. And I mean no offense to green tea drinkers at all. My taste buds are just not that sophisticated. So when Detroit Bubble Tea opened in Ferndale I didn’t pay much attention other than to wish them luck. But when they became a sponsor of oc115 I got a chance to go in and see their extensive menu board and the counter full of colorful syrups and bubbles and mixing apparatus and I thought, no, this can’t all be as bitter as I remember it. 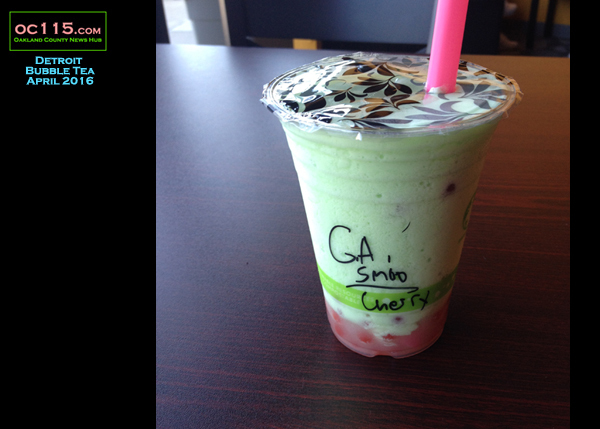 Turns out Bubble Tea is not necessarily “tea” at all. Bubble Tea is basically a flavored tea with pearls at the bottom. There are three options for the pearls – tapioca pearls, coconut jellies soaked in flavoring, or popping boba which are little bubbles with a thin outer layer and flavored liquid in the middle. No matter which type of bubble one prefers, there are multiple flavor options. The tea itself comes in many flavors. Some are tea-based. Some are coffee-based. And some are juice-based. Once a person chooses the kind of pearls they want and the flavor of the drink, they get to decide if they want a tea that is liquid, slushie or smoothie. The smoothies are made with cream. The first time I got a green apple smoothie with popping cherry boba. The second time I got an almond flavored smoothie with coconut-flavored coconut pieces. The smoothies were a lot lighter and more refreshing than ice cream smoothies elsewhere. It was a very nice consistency and the small was filling enough for my tummy. As far as the bubbles, I already know that tapioca is not for me. 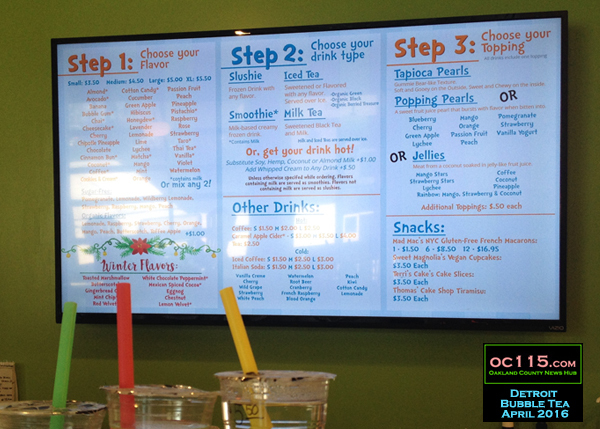 Between the popping boba and the coconut though is a hard choice. I think mood would ultimately be the deciding factor. The popping boba are just plain fun. But the coconut felt more substantive and comforting. In the future I will probably continue drinking both. I should also add that part of the fun is the way Bubble Tea is served. For one thing, the whole atmosphere is whimsical, bright and pre-school-like. The owners created adorable Bubble Tea characters that decorate the walls. The drinks come in clear plastic cups sealed with cellophane at the top instead of lids like many people are accustomed to. To get to your drink, you take a brightly colored, extra large straw and pierce through the cellophane. There are just lots of little things that make Bubble Tea an experience. 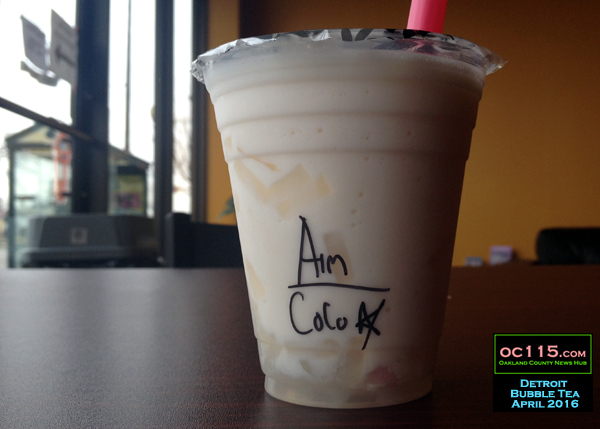 Plus you could go there every day for a year and have a different flavor/texture/boba combination. Some of the more unique flavors available include violet, taro, lychee, honeydew, cotton candy, chipotle pineapple, and avocado. 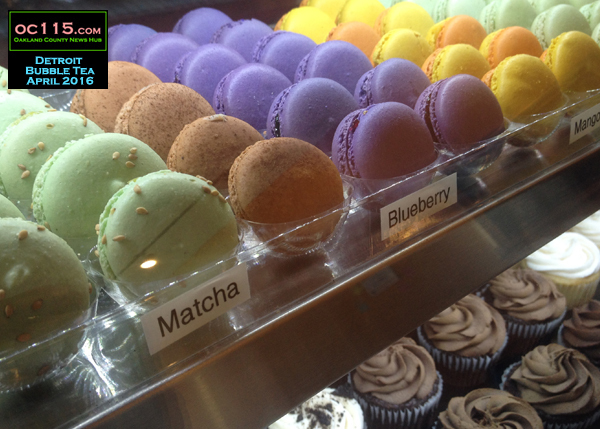 In addition to the drinks, Detroit Bubble Tea has a variety of sweets including cake and cookies. And the best part is that once the novelty of the process wears off, there is still a genuinely refreshing, reasonably priced, drink that adults and children can enjoy. It’s also a great atmosphere to get some writing done – good wireless, tables, interesting people-watching. Detroit Bubble Tea is located at 22821 Woodward Ave in Ferndale – between Rust Belt Market and Twisted Tavern. 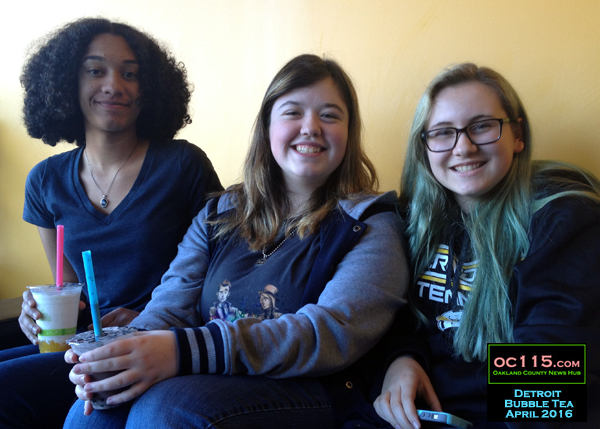 They are called Detroit Bubble Tea because the owners Arun and Alycia Prasad have dreams about expanding through the Metro Detroit area. Read more about it at www.detroitbubbletea.com. For other “Reporter Food” columns go to http://oaklandcounty115.com/category/blogs/food-blogs/.